I wanted a complimentary page for the layout I did the other day. 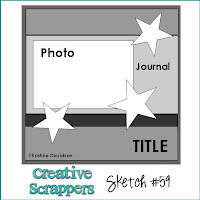 Lo and behold, Creative Scrappers had a great layout for the one picture I wanted to use. I have used quite a few elements on this page. This is the Key To My Heart paper. The Fancy Cut Botanicals match this paper beautifully, so that is how I created the layered flowers. The tulip corners are the felt Heartfelt Whimsy die-cuts, and the Creme Brulee metal corners are from the Mini medley Collections. I've used three different designer ribbons and borders from Fancy Cut Borders. The alphabet is Typewriter Keys (love this one!). I've put Cirecle Window Charms on the word cruise, and I also put one over me and Jerry in the photo. Lots of little bits and piece, but I sure do like the versatility of all the matching accessories for this paper! Yummy page, Brenda! I love all the bits and pieces you used for this page. It is a great complimentary page for your other layout. I think Key to My Heart is so Yummy!